What are the costs of federal programs and policies? What results do we get for that spending? These two questions are fundamental to understanding public value and cost effectiveness, yet issues of cost, performance and impact often exist in silos. That’s a problem, since when financial management, performance, and evidence communities work together to tackle important agency or cross-agency challenges and opportunities, government produces better results, often at lower cost. Why do those silos exist? A key reason is that these communities use different tools or lenses to carry out their work. They often operate in different offices within agencies and have different goals. Consider the question: Is this program (or policy) working or not? The three communities ask different questions about performance. For the financial management community, including chief financial officers, the key question is, of course, about money: Is this program spending appropriately and according to program and accounting rules? For the performance community, including performance improvement officers, the key question tends to focus on outputs and outcomes: What did this program achieve? And for the evidence community, such as chief evaluation officers, key questions focus on implementation and impact: Is this program being implemented as intended in an efficient way and what causal effect does it have? Despite these differences, the three communities have important overlapping interests and approaches that can benefit each other. Integrating cost information into performance management discussions, for example, helps decision-makers track trends in costs and cost-effectiveness. Leveraging financial data and cost-benefit analyses in rigorous program evaluations helps decision-makers understand return on investment. And cooperation between evidence and performance staff can ensure that performance management efforts are informed by implementation insights and estimates of impact, not just outputs and outcomes. In short, there are important reasons to bridge these silos. In May, about 200 officials from more than 30 federal agencies took a first step. The event, called the PIO/CFO Summit, was co-hosted by the Association of Government Accountants and the American Evaluation Association. Participants discussed how to better integrate cost, performance, and evidence efforts and, in doing so, better achieve their agencies’ missions. From those discussions, we identified five suggestions for agencies. Learn from other agencies. Some have made important strides in recent years to not only prioritize the use of information related to evidence, performance, and cost, but also to help integrate those different lenses. One agency highlighted at the summit was the Small Business Administration. One of us (Mr. Gribben) described how the agency launched a central evaluation office and a chief data officer role within the CFO’s office. The agency also created an acquisition vehicle for program evaluation that incentivizes the use of cost-effective data-collection methods. And it publishes a learning agenda—a document that identifies high-priority research questions—and makes it a priority to act on the results of evaluations. Identify your agency’s most important problems or opportunities. When agency leaders are clear with their staffs about what the most important organizational challenges, risks, and opportunities are, it provides a focal point and motivation for different parts of the organization to work together. Moreover, organizational leaders should set expectations that these offices should be working together. Use new evidence-based policy tools as an opportunity to bridge silos. Legislation currently being discussed in Congress puts some of the recommendations of the recent Commission on Evidence-Based Policymaking into law. That includes requiring every federal agency to create a learning agenda. The creation of learning agendas provides a valuable opportunity to bring together the PIO, CFO, and evaluation experts. Include the chief evaluation officer (or other senior evidence person) and CFO in agency quarterly performance reviews. Doing so creates a bridge between performance, evidence and financial efforts within the department and brings different lenses to tackle priority agency challenges. Have deputy secretaries embrace their chief operating officer role. One of the best ways for agencies to overcome silos is for a deputy secretary to be a strong COO. That means taking responsibility for agencies’ outcomes and operational excellence, as well as playing quarterback by corralling the various chiefs within the department—for finance, performance, and evidence, but also for data, acquisition, human capital, and information technology—into a coordinated approach. The PIO/CFO Summit demonstrated the value of dialogue between the financial management, performance, and evidence communities. It sparked the conversation and created momentum. 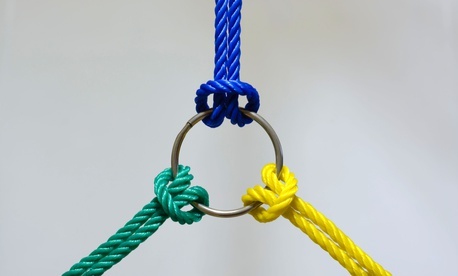 It is now up to the public-management community, inside government and out, to work toward a vision in which separate silos are replaced with interconnected strategies to help agencies succeed. Tim Gribben is the Chief Financial Officer and Associate Administrator of Performance Management at the Small Business Administration where he has responsibility for all aspects of SBA’s financial management (including preparation and submission of the agency’s budget and financial statements), performance management (including program evaluation), internal controls, and acquisition.